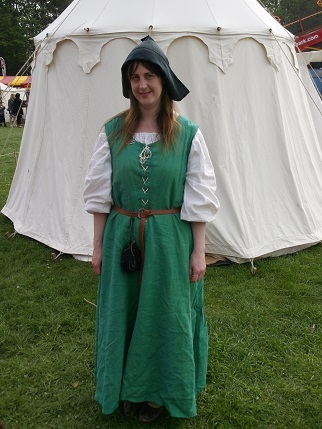 Hello there, we have just got back from a lovely (if wet as always) weekend at Ashby de la Zouche Castle where we were doing a show. Over a 1000 people braved the weather this Bank Holiday to come and see us which was very nice of them. The boys in the group have been working really hard all winter on their new kit so I thought you might like to see some pictures of them in their finery. Luke has adapted his outfit to include chains that hold his horned great helm and his swords so that he can hang the helm from his back as he fights (he wears another smaller helm underneath to fight in). 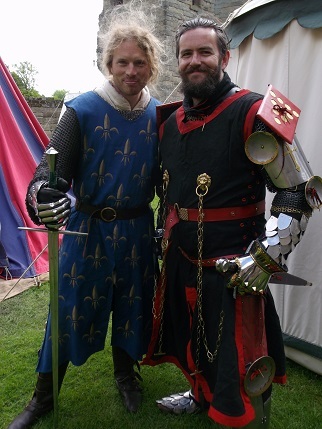 You can see the chains here on this picture of him and our newest member Jamie and again on a picture taken at the last show of all of our knights on the steps of Bolsover Castle. Thanks to Jamie for these next two photos. 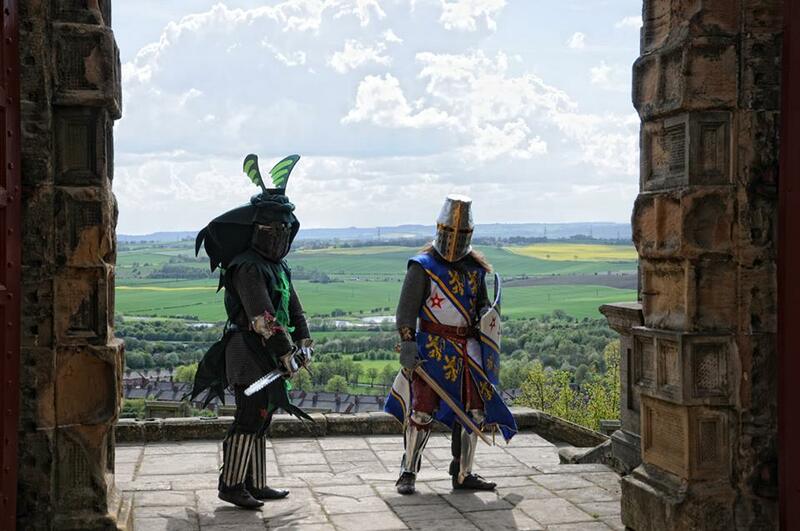 This picture below was also taken at Bolsover and you can see more clearly the helmet that Mark our Dragon Knight was wearing for that show which had a St George’s day theme. 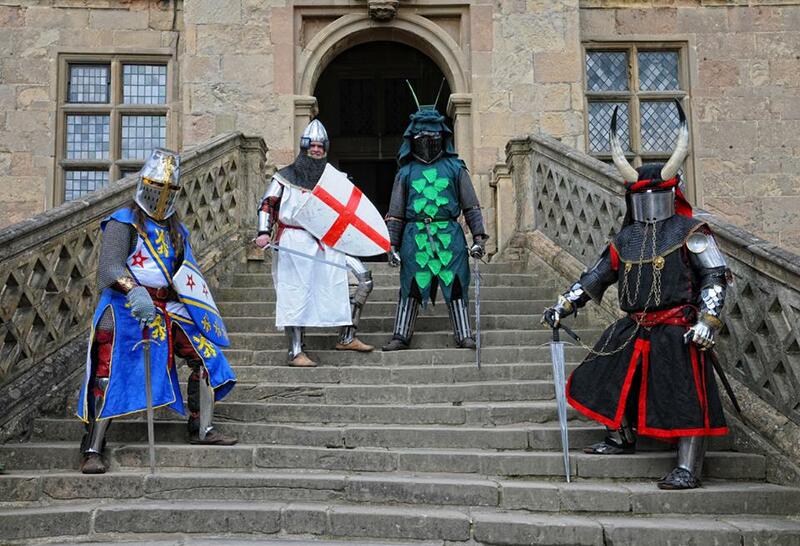 Paul in the blue is a wonderful artist and his costume has such detail on it, his belt has stamped and painted lions and the surcoat and shield are all hand painted. Shane has got a lovely new helmet for this season (yes it does look a bit like a lemon squeezer!) 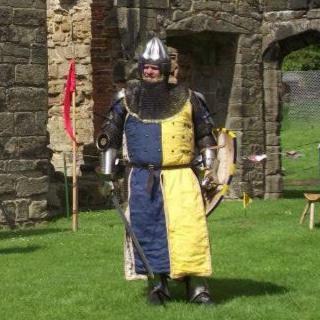 and some new armour – this picture was taken by one of the visitors as I didn’t get chance to get close-ups due to the inclement weather but he has new arm and leg armour in a blue tint and a new armoured surcoat with plates inside it. We have a packed summer ahead of us which is brilliant. 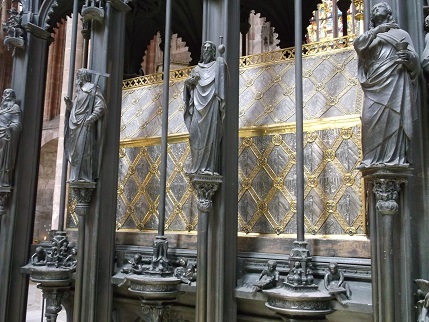 This weekend we are off to Somerset for an event followed by our week visiting National Trust properties and then another two events to finish off June. I am really looking forward to the months ahead, my teaching finished last week (just some large piles of marking to come) and my lovely group bought me some gift vouchers for a local wool shop which I am really looking forward to spending! 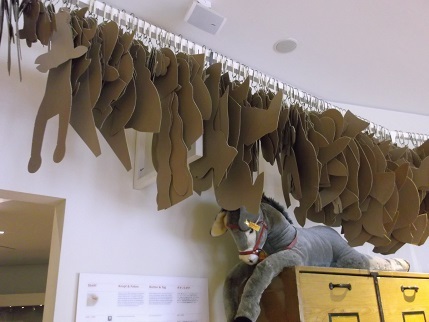 Just about to make up the first of my (no doubt many) Little Cotton Rabbits elephants and have lots and lots of projects planned for summer – going to make the most of the newly sorted craft room. Hello again, I hope that you have all had a good week. I have been enjoying another weekend at home and our first at home BBQ of the year, my last weekend here for two weeks as I have shows then a holiday with my friend Kerry! Last year we took the opportunity to travel round some of the National Trust properties down South after one of our shows and are doing the same again this year going to visit some places in Somerset, Dorset and Devon. I am so happy that the season has started again, the joys of cooking bacon butties for breakfast outside the tent and meeting lots of lovely people – it is a great way to spend a weekend. 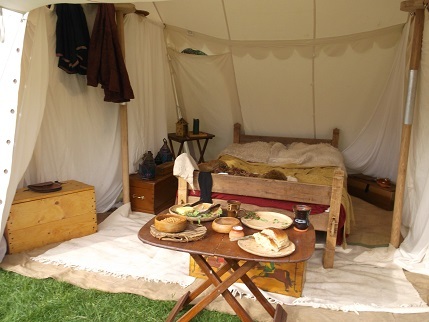 Look at this lovely tent owned by one of our friends – wouldn’t you love to camp in this? 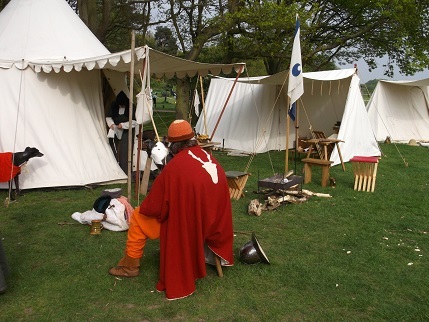 The theme of the first show this year was crime and punishment as it was in Sherwood Forest the home of Robin Hood and his band of merry men. 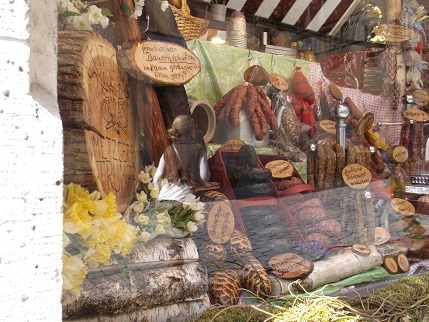 We had another great weekend with really lovely weather so lots of people came to see us. 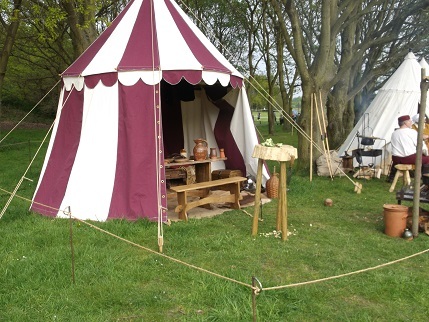 It was just a small event with about 8 groups but there was plenty to see in the living history camps. It was also a very significant first because Ellie came up in Kim and we drove all the way to re-enactment in the car! She did really well as we went on the motorway and she was not at all fazed (even when there was a big lorry trying to come into the lane). I am really proud of her and it was very lovely being driven all the way there (and back as well by my brilliant friend Kerry). 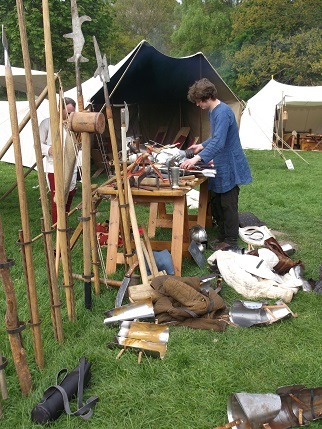 We were camped with some friends who were doing weapons and armour talks all weekend and we did our usual headdress and embroidery talks which was a nice complement to their display. 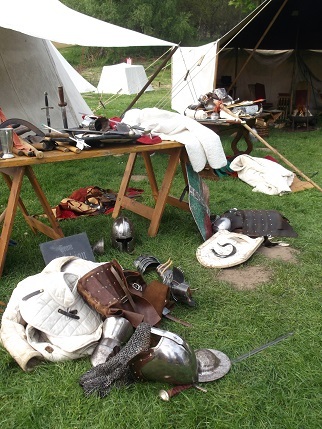 This picture shows the camp after the battle with the boys’ arming jacks and paraphernalia everywhere! And we had the great excitement of a new recruit to the group at her first event. And not just a new recruit for the main group this is our new sister for our little watercarrying group. Here is Sadie all dressed up and ready to go for her first show. Sadie works with Ellie at Hardwick and has been sword training for a while but decided she would like to join us as well and she really enjoyed herself, she will be coming to many of our future shows as well. Thanks for visiting and see you in a couple of weeks. 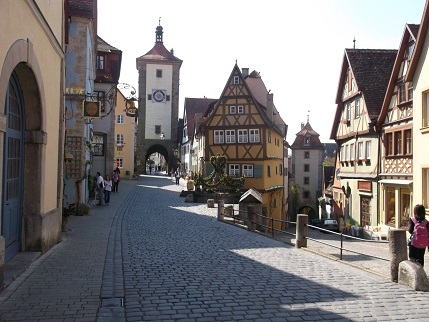 Our last trip while in Germany was to Rothenburg ob de Tauber, a gorgeous medieval walled town on the Romantic Road. 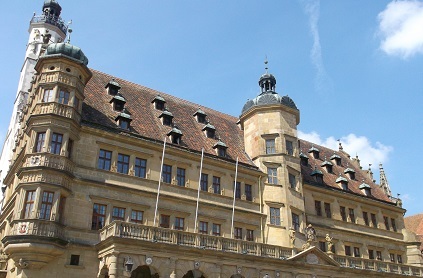 Not only was the setting perfect, surrounded by forests and rolling hills and fields, but the town itself was so pretty. I felt severely underdressed and should really have been wearing traditional dress at least if not a Belle outfit, it really was like stepping back in time. 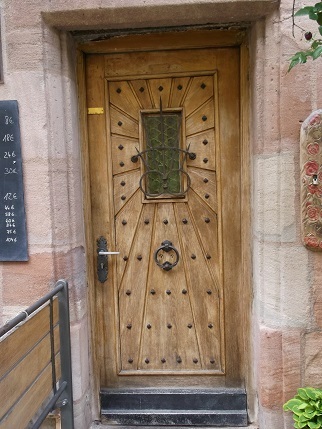 Not only was it gorgeous but there were so many lovely shops, food, gifts, weapons and armour (and embroidery and Christmas shops as I mentioned in my earlier post). 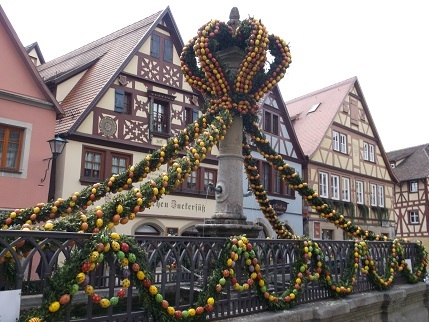 We spent so much time shopping we didn’t get to see all of the town so would love to go back someday for longer. 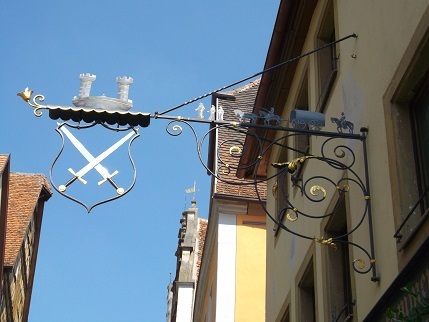 All of the shops and hotel had beautiful signs outside them as well, this was the weapons’ shop sign. 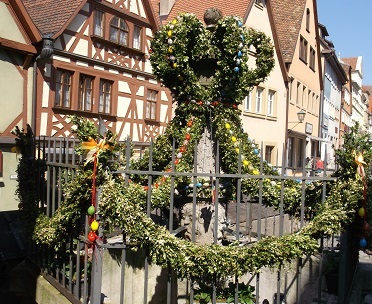 The wells in the town had all been decorated for Easter, these were all real eggs, hand painted and they looked beautiful. A wonderful sunny day out and a perfect end to our trip. 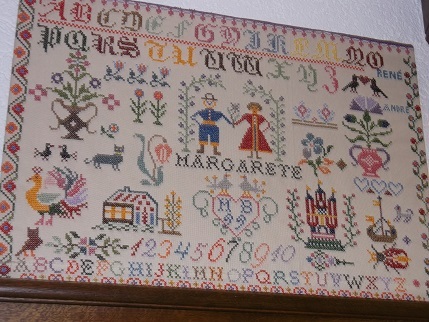 The first nice surprise was this beautiful sampler which had been done by Margarete the lady who ran the hotel we stayed in Germany. She was in her 70s and the hotel has been in her family for over 100 years. I couldn’t help thinking that she must have had a pretty hard life, she was on duty about 15 hours a day when we were there and I hope that at some points they got to close the hotel and have a holiday themselves. 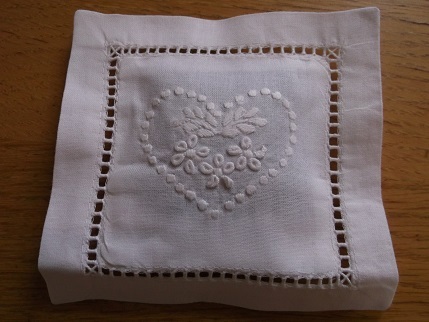 I like to imagine that she stitched this in her free time and it gave her pleasure and helped her relax, it is a beautifully stitched piece and she was obviously proud of it as it was hung in the bar area. 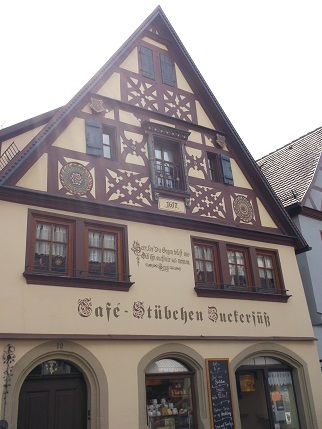 Then we had our unexpected trip to the Steiff Teddy Bear Museum which was an optional trip on the holiday which the kids really wanted to go to. It was really good with a little interactive piece at the start that told you the history of the company followed by a room with lots of toys that you could touch (and sit on) then displays of the toys throughout the ages. The company was started by Margarete Steiff who was a keen seamstress, she had polio as a child and never married but sewed children’s clothes then made her first toy, an elephant (by accident it was meant to be a pincushion but it got played with!). 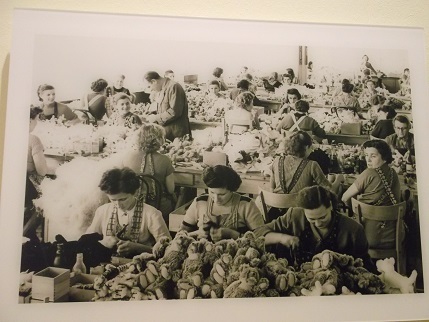 She then went on to make teddies and all manner of other creatures. 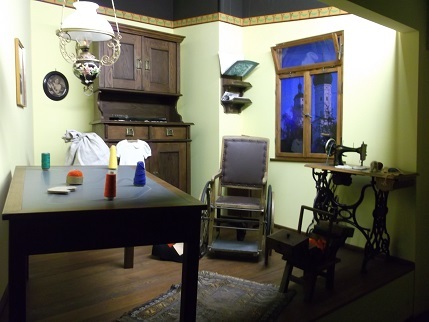 The above photo shows a reproduction of the sewing room that starts the interactive part. 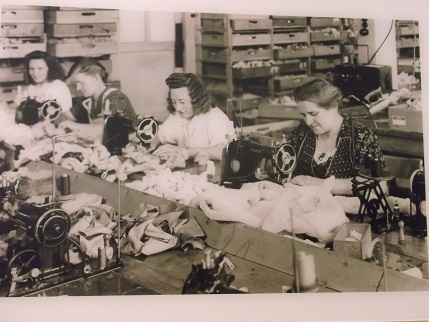 One of the most interesting parts for me as I have been making toys recently (both knitted and have started a couple of fabric ones) was the workroom at the end where as well as staff working demonstrating the toys being made they had lots of patterns hung up and old photos showing the factory workers. 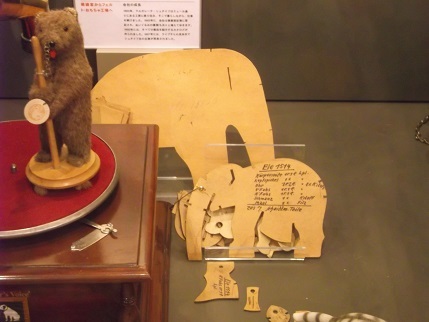 There is a concise history of the Steiff business at this link if you are interested. 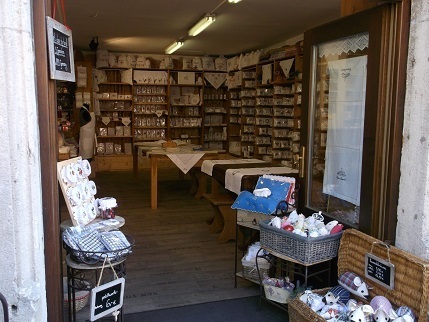 Then when we went to Rothenburg we came across this shop selling hand embroidered textiles. They employ over 500 home workers to do the embroidery so I had to go and support the local economy and all those lovely ladies didn’t I? 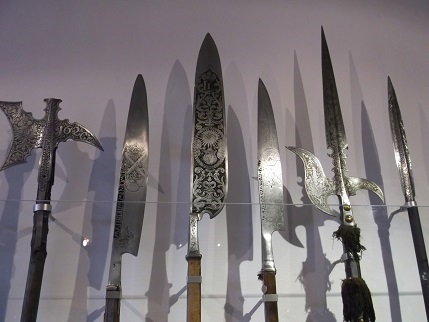 The kids were very patient while I chose from hundreds of gorgeous things. 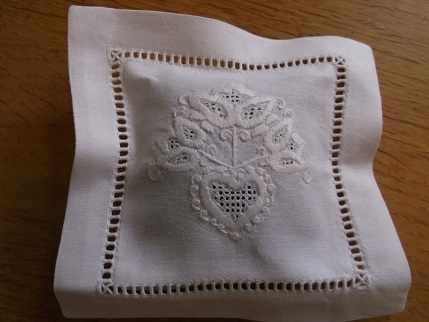 I bought these beautiful lavender filled whitework pillows for display in my kitchen and an embroidered runner for the Xmas table. 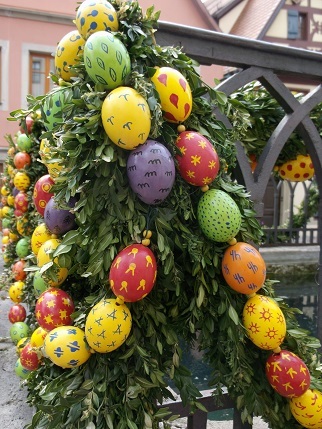 As I reminded Jake I do only have 4 (he seemed to think that was too many last year – no idea why?). 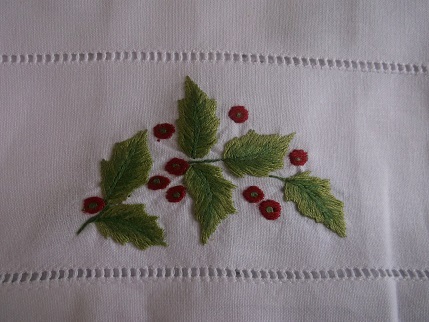 This one will go very nicely with my holly decorated dinner set). 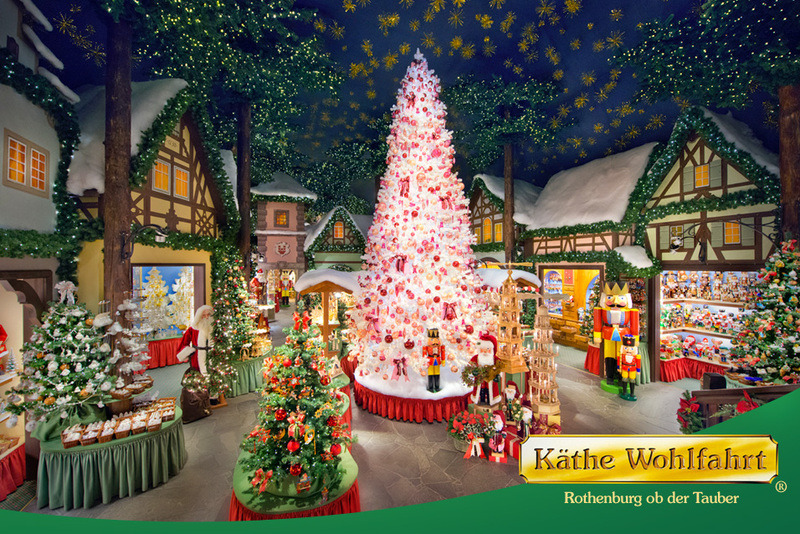 Rothenburg is also famous for its Christmas shops (which I honestly didn’t know when I booked the trip kids) and so spent ages in the Christmas Village in the Kathe Wolfahrt shop which was amazing! 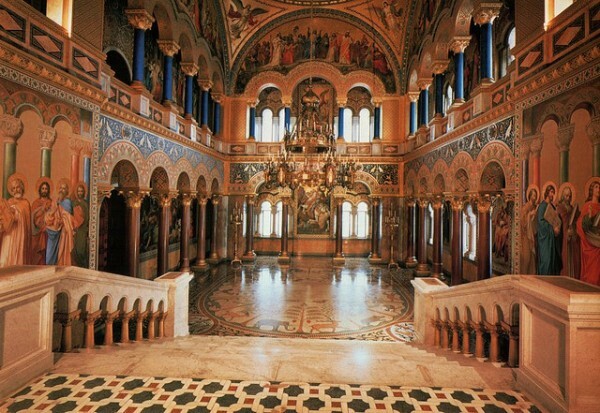 No photos allowed inside but this is from their website and it actually looks like this. 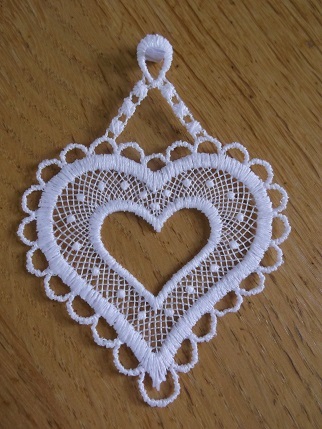 I bought 2 beautiful lace ornaments for the tree and a little heart that hangs in my kitchen. 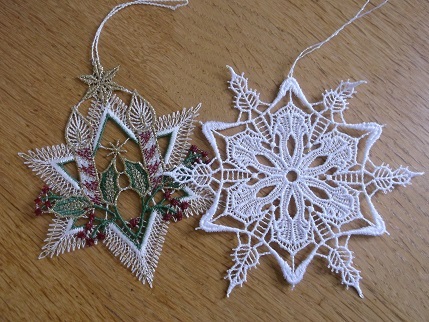 A wonderful array of textile goodness to add to a lovely holiday – very happy. 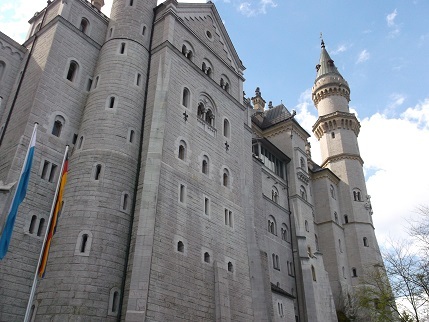 Probably the best castle in the world…. 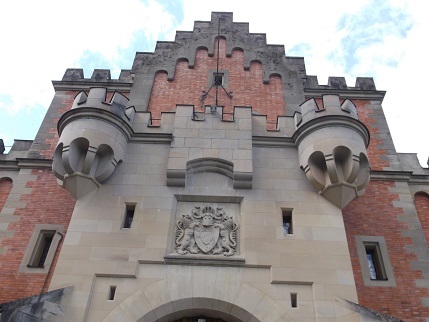 As you know we are big fans of castles, we have been lucky enough to camp in the grounds of lots of them and have visited many different types from derelict piles of stones to beautiful Victorian rebuilds (Castle Coch and Cardiff Castle). But I think this is my favourite so far. It is one of the most beautiful places I have ever visited (and I have been very lucky to go to some amazing places). 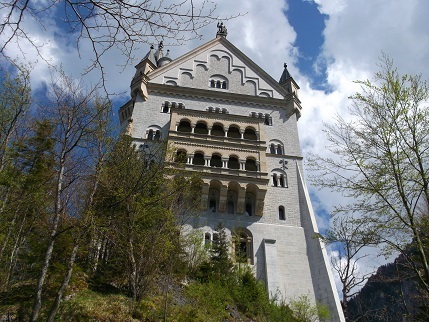 Not only the castle itself but the location is stunning. 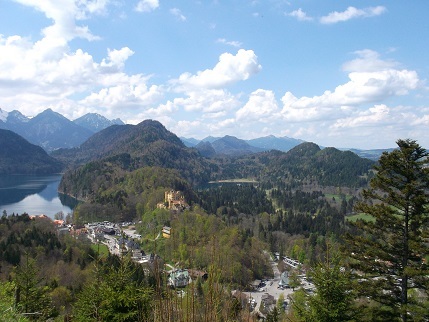 These are the views from Neuschwanstein Castle in Bavaria, built by King Ludwig in the 1880s. The yellow castle you can see is his father’s castle and these are pictures of the one he built. Sadly he only got to live in the castle for a short while before he died. 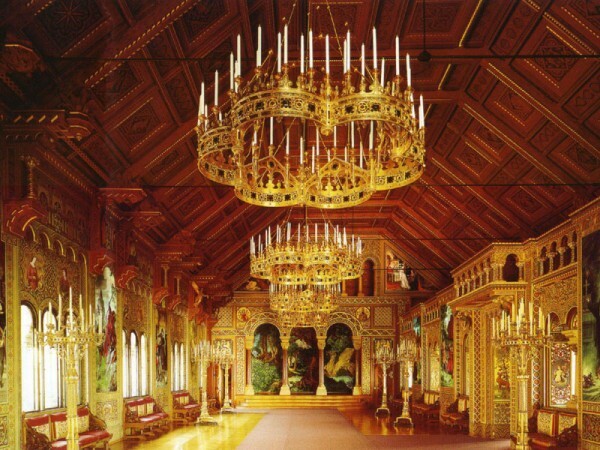 The inside is amazing as well – wonderful wall paintings of Wagner’s operas and goldwork that you wouldn’t believe on all the furnishings. 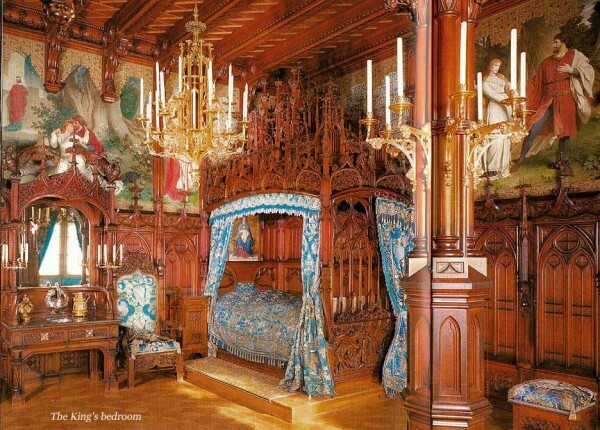 No photos allowed of the inside as expected but thanks to the miracle of Google images I did find these to show you of the bedroom, great hall and king’s chamber. 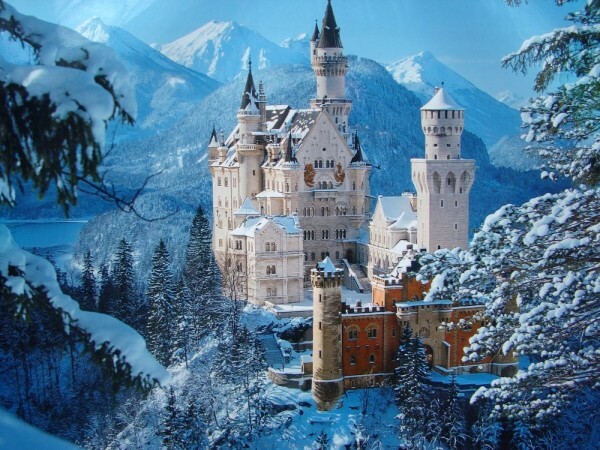 And there are some amazing shots taken by helicopter, look at this one of the castle in Winter – fairytale or what? I now have a mousemat with one of these photos to remind me of the beauty whilst at work. 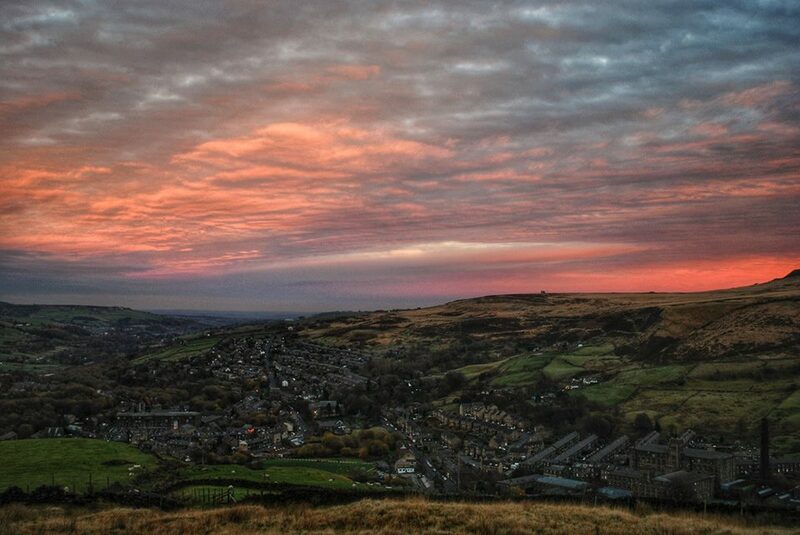 Will show you some more of the trip later – meanwhile am still enjoying living in my beautiful Marsden as well until I can afford a castle like that, look at this for a gorgeous sunset, picture from the local group Facebook page. A rainy Saturday in Yorkshire (again) just right for a bit of a catch up on photo editing and blogging. 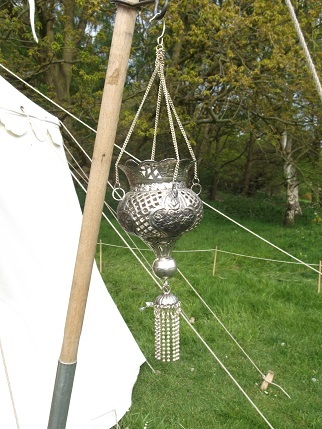 We had a really lovely weekend in Sherwood for our first event, the sun shone, I got a bit brown and lots of people came to see us. 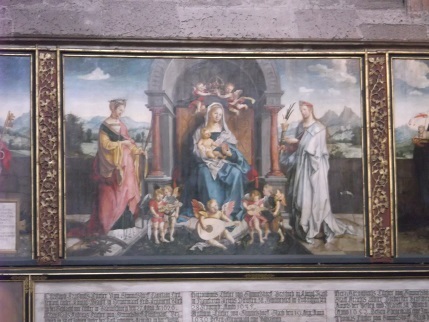 More about that in a later post as I have some beautiful places to show you. 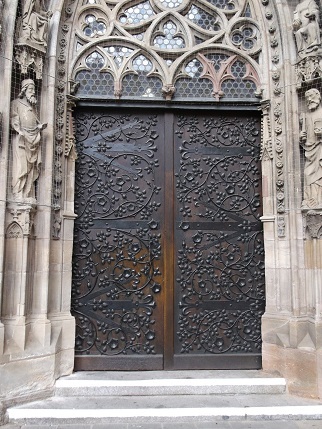 There were also some fab doors – look at these from Nuremberg ! 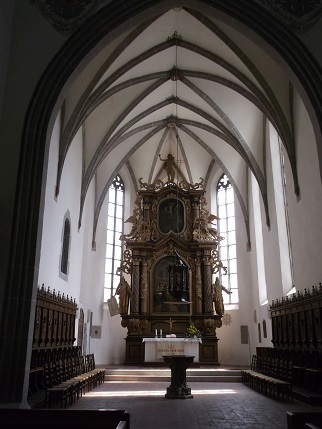 And lovely old churches – the bottom picture is of one in the town where we stayed – Langenau. 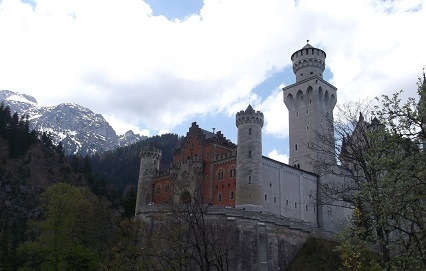 The holiday we went on was called Beautiful Bavaria and they weren’t wrong. 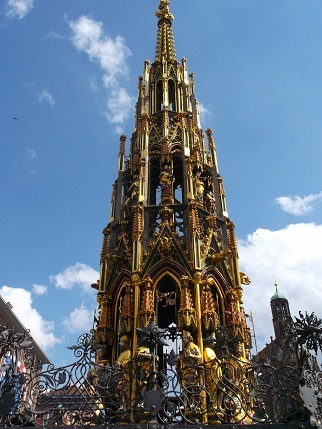 It was my first ever trip to Germany and I will definitely go back. 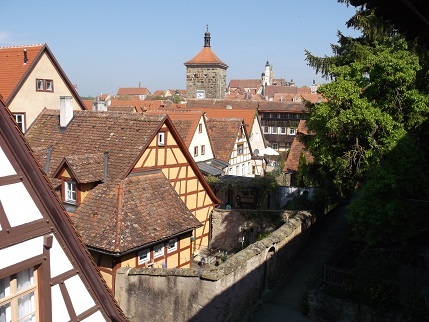 What a gorgeous country full of all the things that I love best, mountains, castles and old medieval towns. 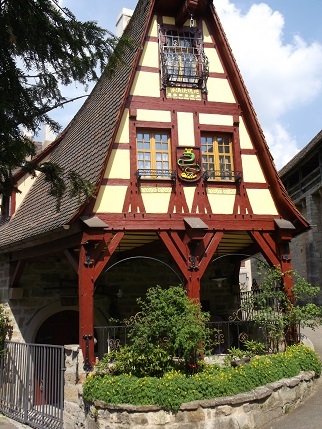 It was stunning and I felt like I had landed in a Disney film set a lot of the time, all the inspiration for his Fantasy Lands at the Disney parks obviously came from this gorgeous architecture. This was our first trip solely by coach, we went with this company, Shearings, to Italy two years ago but flew that time. 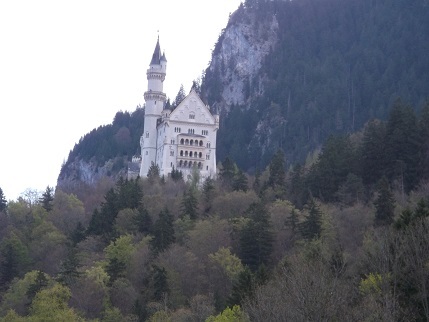 It was a great experience being able to see lots of Europe, we caught the ferry from Dover and went through France, Belgium and all the way down to Bavaria, stopping in Belgium overnight each way. Lots of time to stare out of the window (how I love not driving!) and lots of time for knitting – perfect! 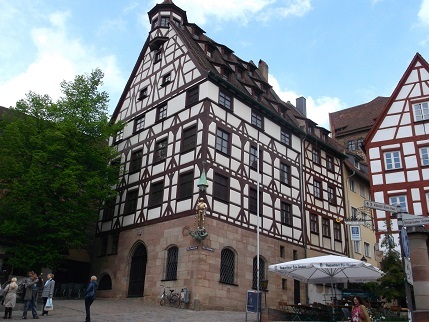 We had a great driver/guide who had researched lots about Germany history and so we learnt so much while we were there. The sort of holiday we all really enjoy. 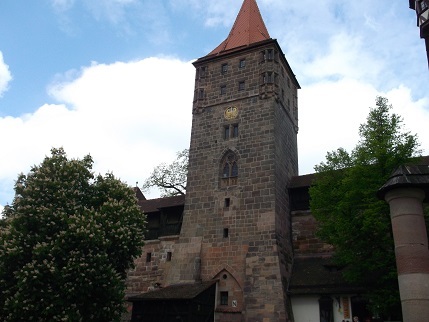 Our first day trip was to Nuremberg which was very lovely, they have done a great job of rebuilding what was damaged during the war and the castle, churches and beautiful old buildings look perfect now. 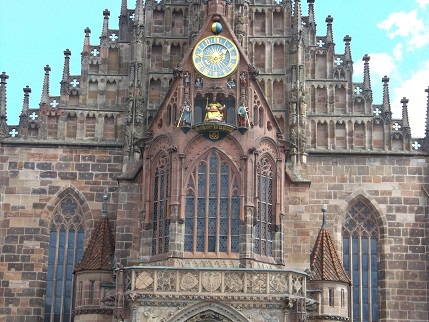 Below is the church in the city square with its famous clock. 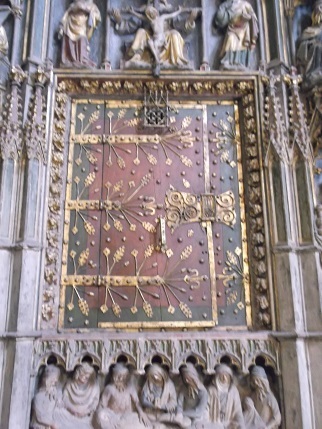 The pictures below show the inside of one of the other churches where there was the most gorgeous little door (think it would have held an icon originally) as well as this casket in gold and silver. 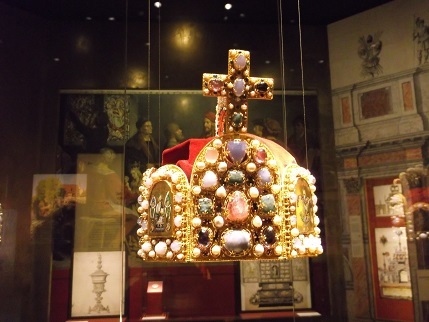 We visited the castle which had a great museum, this crown (which I think belonged to Charlemagne) was very impressive and the boys from my medieval group would love to get their hands on these weapons. 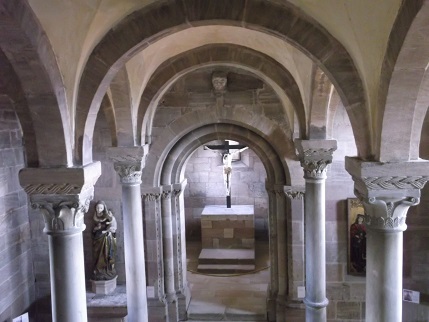 This is the chapel in the castle which was very simple but lovely. It was a brilliant trip and I have more pictures for you later. Meanwhile hope you are having a lovely weekend and thanks for visiting.